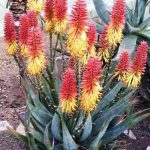 Very much a plant for the collector – this medium sized aloe cultivar is difficult to propagate. Consequently it will never be available in large numbers. It produces multiple inflorescences, each with many racemes. 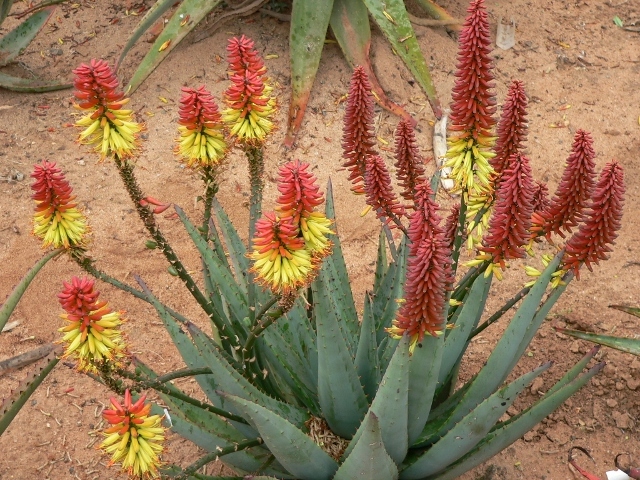 The inflorescences branch at a very low level, creating a splash of red and yellow colour directly above and around the plant. Flower time is from early to mid winter. 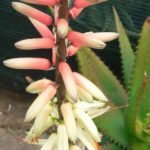 The stemless plant with its neat, greyish leaves and small dark spines is like a miniaturised large aloe that will not take up too much space in the front of the rockery. Because of its structure and the fact that it does not produce stem shoots it is very well suited to container planting as well. 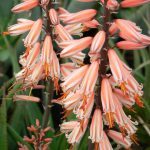 We have chosen Aloe ‘Meringue’ as a partner plant for ‘Aphrodite’ because of its contrasting colour display.